Hey guys, I'm new to pythonista and I need your help. I want to create a kind of calculator. I have tried it so many times, but my result has never been accepted. In the blue circle you should specify the number. In the yellow circle is the price of the product. In the red circle is the "Ok" button, which calculates the number of specified products. In the green circle then the result, so the price stand. It would be nice if you could help me, because as a beginner I really despair of it. it would be nice if you could explain your steps. n.keyboard_type = ui.KEYBOARD_NUMBER_PAD will keep the input numeric on iPhones but not on iPads. The OK button is off the screen on an iPhone 7 unless you switch to landscape mode. @cvp it does not work for me? which tools did you use? I have a label for the name of the products and the price. At the input field of the number and at the result a textfield. @some-user Sorry if I didn't correctly understand your post. Do you want also to enter the name of the items and their unit price? Is there product in a label? Or which tool would be used in the case? After the product comes the number you should enter. Is that then a text field in the case? You have to enter a number. And behind is the price. Which tool do you use for this? Then press the "Ok" button, which is on the bottom right. The ok button calculates the whole thing and the result then appears on the lower left, in a field. In my example, the result would be, so the total price would be 18.50 €. That number would pop up, anyway. So that was just one example, the whole in the sketch I sent as a Twitter link. Thanks for your helpfulness :) I'm sorry, but I'm not checking it yet. @some-user Still one question: did you try my little script? And you ask "which tool" but do you use the Pythonista app on iPhone/iPad or do you have an Android device like in your twitter image? Here is a Pythonista forum, thus my question is obviously stupid. @cvp Of course, I tried your script, but it did not work. So I thought I've made my ui wrong. That's why the question with the tools. I work with Pythonista on my iPad, but this is what I'm doing right now on my phone. I only work with my iPad and have no social media on it. Take your time. I think it's very friendly and not a matter of course that you help me and I'm really grateful. You might get better help if you post your code and UI, and explain what your problem is. To post a UI, you can tap the Edit button, in the library menu, select the pyui file and py file, then tap the share button, and then share to gist. @some-user As my little dirty script works on my iPad, could you explain what doesn't work for you. Problem of screen dimensions? Error message? @cvp So there is no error message with me. It turns up without any message. I enter the numbers and press the Ok button. But nothing happened. So I assumed that I have mis-designed my UI. Could you show me how you designed yours? @some-user I can't show more than the script, all is included in it, without any external design, that's why I don't understand your question, I'm sincerely sorry. Do you use my script without changing it? If you run it on your iPad, do you also have troubles? @some-user Perhaps I did not understand your post. If you have your own script and your own UI design, and your script does not work as expected, in this case, as adviced by @JonB , post here your script and your .pyui file. For this last one, you can share it as gist or rename the file as .txt, edit it, select all, copy and paste here in a post. @cvp sorry for the poor quality, but i had to go fast. So that's my script.pyui. It has a size of 600 x 600. My background is a custom view. I've always used labels in the red circles. In the blue circle I have used text fields so that there can be entered the number of products sold. In the yellow circle is the button that you click after entering the numbers. He calculates it and the result appears in the green circle, which is also a label. Because it's wrong with me, I thought, I made it wrong. 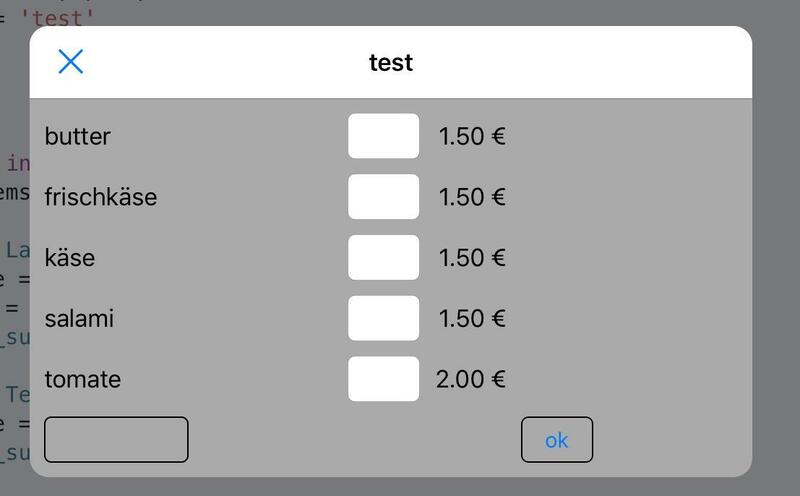 For example, to replace a text field with a label. That's why I asked you. I just copied out the code and used it. If I press Play then this picture appears exactly what you see in my Twitter link. I can enter numbers in the text field, but if I press the button nothing happens.